It is officially fall weather here in Vancouver. So, in getting ready for the fall, I wanted to share with you three trends that are timeless; trends you can count on to look great fall after fall, after fall. As soon as the weather turns colder, you can bet that plaid will be back in fashion. The nice thing about plaid is that you can make quite the statement with it – as I did with the above shirt. Or; you can use it as more of an accent to your outfit – as I did in the outfit below. The beauty of stripes as a pattern is that they can look nautical & summery, or ready for fall totally depending on how you style them. My striped tees are probably the most worn items in my wardrobe for this very reason! To ensure your stripes are “fall ready”; pair them with other fall colors like burgundy or camel – or course mix them with plaid! The quote that leopard is a neutral is so true – especially for the fall. In the fall, leopard print can replace your basic black or tan to give your outfits more depth. Again, pairing leopard print with fall tones such as burgundy is an easy way to create a timeless fall look. "Wednesday Wants: Trendy Fall Items"
These outfits are SO CUTE! Fall is definitely my favorite season to dress for and your outfits are totally inspiration! I agree – fall is SO the best season to dress for. And aww I am so glad you like them! Thanks girl!! Such great fall outfits, I especially love the plaid scarf with the striped shirt. Thanks so much Emma! Happy almost Friday! Aw thanks so much! It took me so long to come up with it haha! And ahh that is AWESOME – owning all these items already means you are so set for fall – score! Im glad you stumbled upon it too! Thanks so much for reading and commenting! Ahh jealous! Plaid is addictive, once i start buying plaid things I cant stop myself haha. Thank YOU for reading this post!! All beautiful looks! 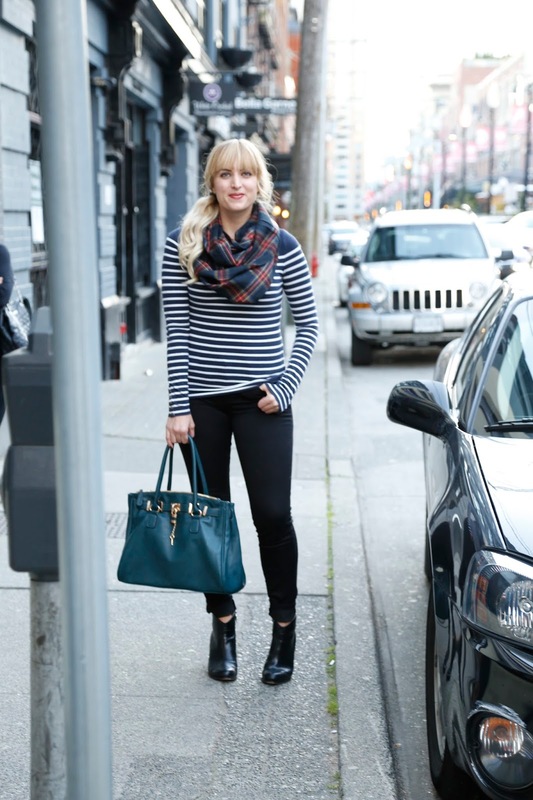 I love the stripe and plain mix, perfect for Fall. Also, you hair looks adorable in the first scarf photo! Beautiful! Thanks Elise! And thank you re. my hair! Loose side pony is a go to when Im lazy haha. I definitely love all these prints and can't wait for fall weather! Thanks girl! And me too! I got my first pumpkin spice latte today lol so I'd say im ready for fall! You put together the best outfits! The stripes/plaid and plaid/windowpane are my favorites! Have a wonderful weekend! All 3 of you look great Lee. 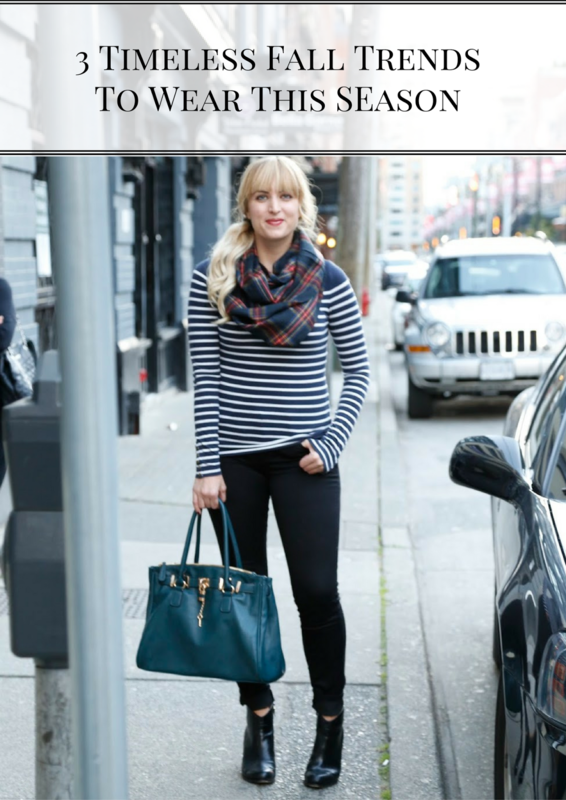 This post has great outfits and great ideas, especially how to wear a plaid scarf. Thanks for the inspirations! Im so glad you like it, thank you Ada! Hope you've had a great week! 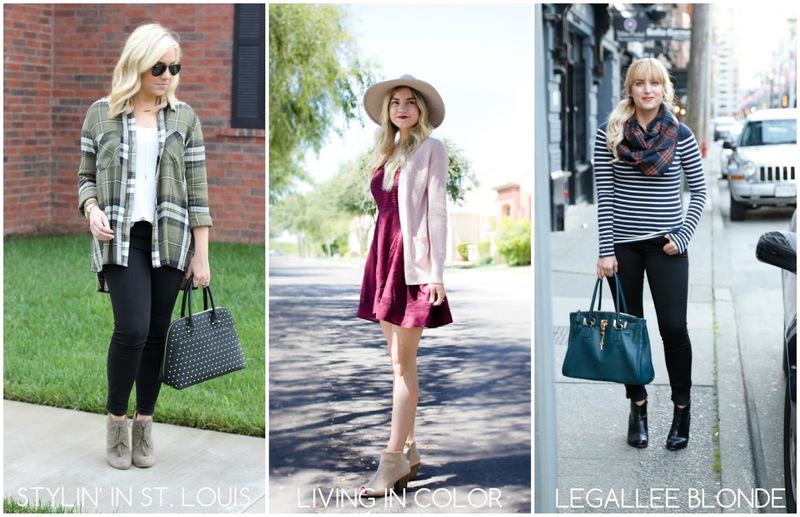 Great Fall outfits – I love all of them and thanks for sharing your timeless fall trends! Love those timeless trends! Also really excited for velvet this season! Three of my absolute favorite patterns and three wonderful ways to style them!